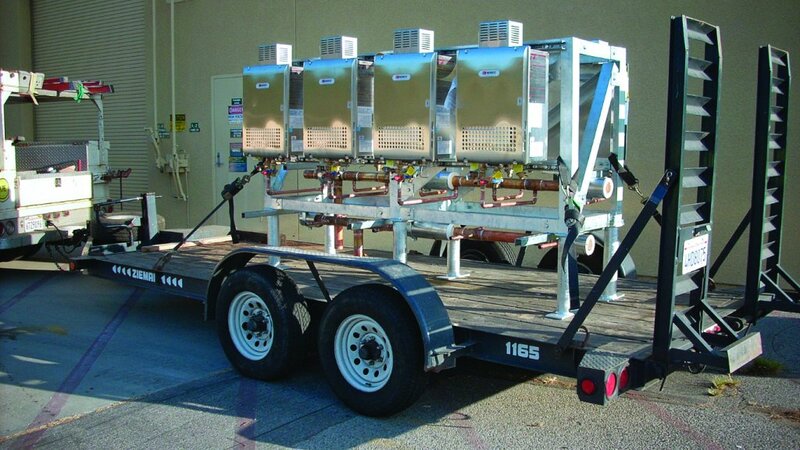 Plumbing installer prefabs eight tankless units into a single multiunit system at each of four buildings, cutting energy consumption and complying with local emission-control standards while meeting the hot-water needs of student-residents. NORTHRIDGE, Calif. — Beverly Watson can easily laugh about the idea today, now that her recent tankless water heater retrofit project has been successfully completed and is fully meeting her requirements. 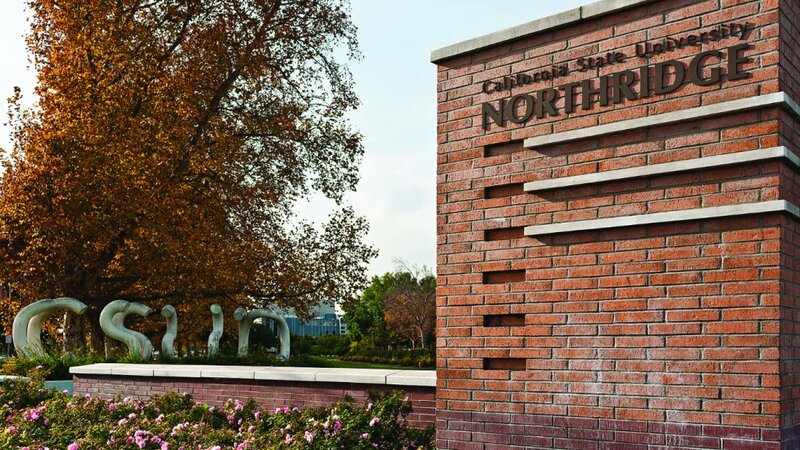 But the associate director of operations for California State University, Northridge (CSUN), admits to wondering last summer while the work proceeded whether eight — as in eight tankless water heaters — were truly enough for her particular application. 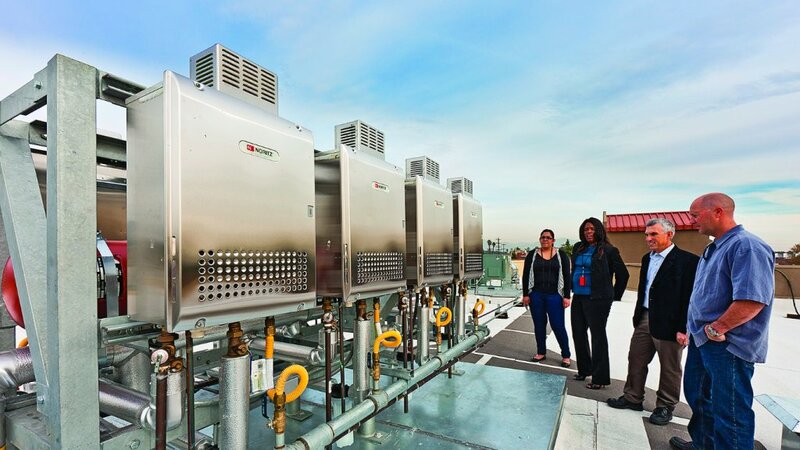 Completed in late August, the CSUN project entailed the complete removal and replacement of the original atmospheric boilers and storage equipment installed when the four student-apartment buildings were constructed roughly two decades ago. 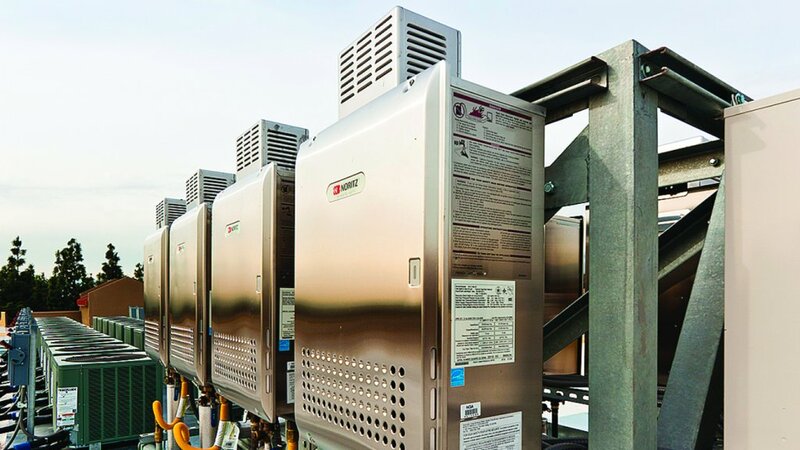 These rooftop systems provided not only domestic hot water to the residents of all four structures, but also space heating (through a fan coil in each apartment). Besides no longer being able to handle the hot-water loads in an energy-efficient manner, the old boilers could not meet the rigorous emission control standards of the South Coast Air Quality Management District (SCAQMD). In short, it was time for a new solution at the four buildings, each spanning three or four floors and housing 37 to 52 individual apartments for two to four students apiece. 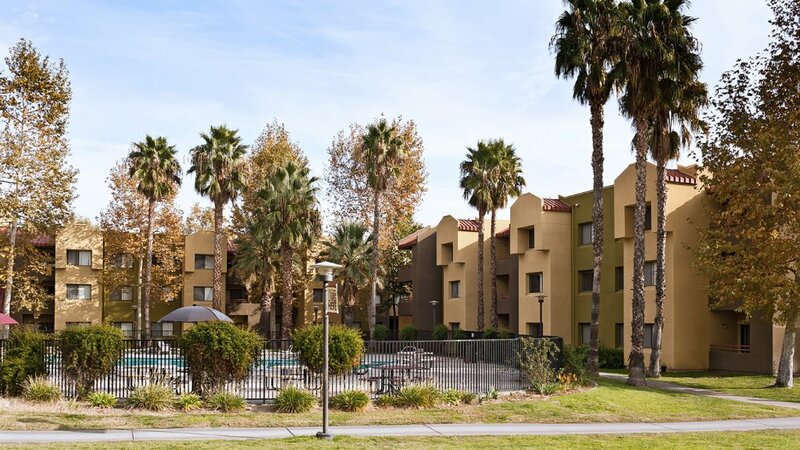 The solution specified by James Valiensi, P.E., LEED GA of P2S Engineering of Long Beach called for each apartment building to have its own multiple-unit tankless water heater system, furnished by Noritz America. These eight units per building would furnish domestic hot water only, with a new and separate heat pump system handling the space heating. The installer also wisely decided against erecting these rack structures from scratch on the four rooftops. Instead, the Suttles Plumbing team chose to prefabricate them at their shop in Chatsworth, located only a mile and a half from CSUN. “Our proximity to the job site made this approach ideal,” says Suttles. Clear-cut choice: The CSUN project commenced in July 2009, when Beverly Watson commissioned P2S Engineering to do a feasibility study: Could the university simply replace the four existing boilers with up-to-date and more efficient models, thereby generating all the hot-water the apartments needed while also fully complying with the SCAQMD restrictions? So Watson began visiting HVAC and plumbing product trade shows to talk with manufacturers of tankless water heaters. She also followed up on their referrals to a couple of recent tankless installations — one commercial and the other residential — to see how they were performing. Once Watson became sold on tankless, she next turned to the question of “Which brand?” She wanted a manufacturer who could provide her plumbing and HVAC maintenance team with service parts in a timely fashion — again so that her students would never be without hot water for any appreciable length of time. “Cookie-cutter” strategy: Installation of the four, racked systems spanned approximately six weeks from June until August of this year. Shop fabrication of each assembly required approximately five days and two or three plumbers. Transferring and anchoring the assembly to the roof was done in a half-day, with another two days to finish all of the pipe connections within each apartment. CAD (computer-aided design) technology played an important role in the prefabrication work, and Suttles is enthusiastic about the possibilities. “This tankless water heater installation is the largest prefab project we’ve ever done, but we experienced no serious problems. The only snag in the CSUN installation occurred after the fact when it was discovered that the pressure balancing valves in the apartment showers were past their operational lifetimes and not properly compensating for the differential pressures on the hot- and cold water systems. The result was a crossover of excess cold water to the hot-water side of the valve, triggering hot and cold bursts to the new, low-flow shower heads. To address this problem, Suttles opted to install a larger recirculation pump on the hot-water system to balance the system pressures and prevent the cold-to-hot bleed-through. This issue should be considered on all retrofit projects involving new low-flow fittings with older shower valves so that appropriate actions can be taken. More tankless retrofits to come: Watson not only quickly grasped the problem and its causes but also intends to avoid it in the future by installing new shower valves whenever retrofitting the domestic hot water system in any residence hall. And there will certainly be more retrofits: Watson recently conducted a survey of the students living in the four apartment buildings, and 77 percent reported themselves content with the new hot-water service. 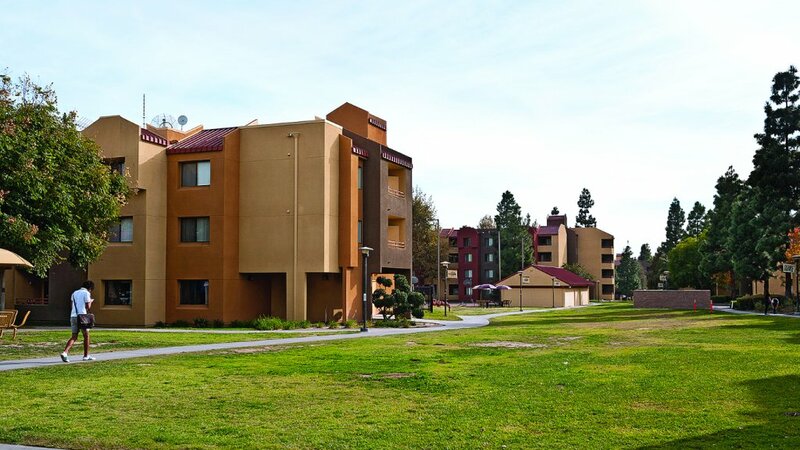 That high percentage convinced Watson that she had made the right decision in opting for a multiple-unit tankless solution, so she is ready to move forward on other CSUN properties. “By year-end, we will have changed out the boilers in two more buildings, plus another four or five in 2011, and we will use tankless water heating in all of them,” she affirms, adding that she looks forward to the results of her first energy-savings analysis of the new tankless setup versus the old boiler system toward the end of 2010. 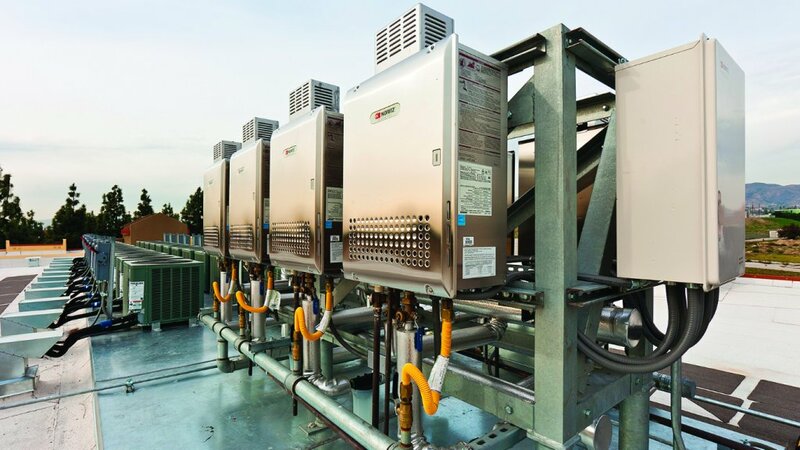 Multiple-unit systems offer another distinct advantage to large end users like CSUN who simply cannot afford to be without hot water, Suttles points out: ”If one unit goes down, you don’t need to shut off hot water to the entire facility. The remaining units may not be able to meet 100% of demand, but at least the occupants have some hot water. In the case of a retail operation, such as a restaurant, you can keep it open and functioning even while the service work is being done. 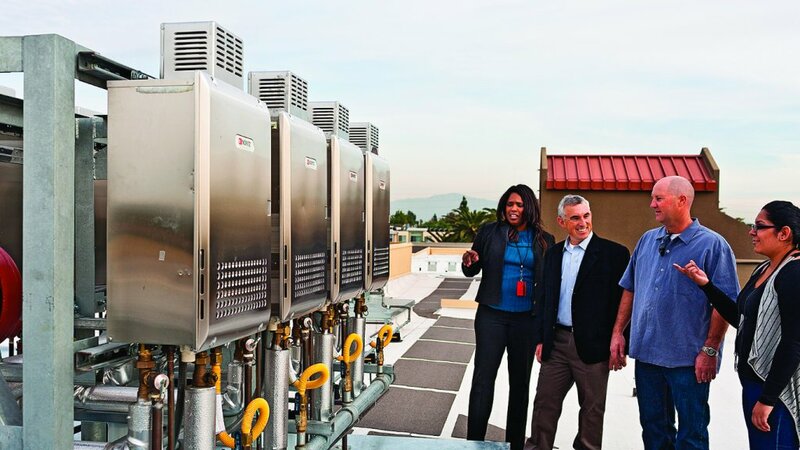 NORITZ AMERICA CORPORATION, a subsidiary of Noritz Japan, has corporate offices in Fountain Valley, Calif., as well as in Dallas, Atlanta, Chicago and Hawthorne, N.Y. Offering a full line of tankless water heaters to meet the hot water demands of residential and commercial applications. Noritz supports its products with a national network of skilled representatives and employees who are committed to providing the finest products and services to our communities by helping consumers live in a more comfortable, efficient and healthy lifestyle.